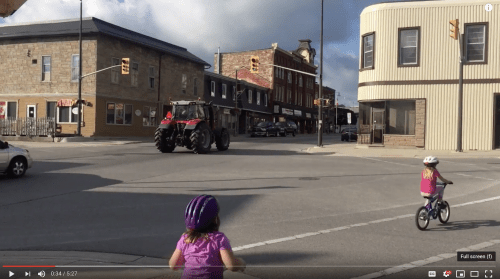 Do you know how to pass farm equipment and other slow-moving vehicles to pass your road test - watch the video. Hi there smart drivers Rick with Smart Drive Test talking to you today about the slow moving vehicle sign, which you'll have to be knowledgeable to be successful on a road test. Now just before we get started here be sure to hit that subscribe button...right about there. That way you'll get access to all the great information for those of you working towards your license or starting a career as a truck or bus driver. The slow-moving vehicle sign is an equilateral triangle. It's orange in the center and has a red border. And I'm visiting my mom here in Ontario in Huron in County, in the town of Wingham. And there are lots of farm equipment vehicles out on the roadways. 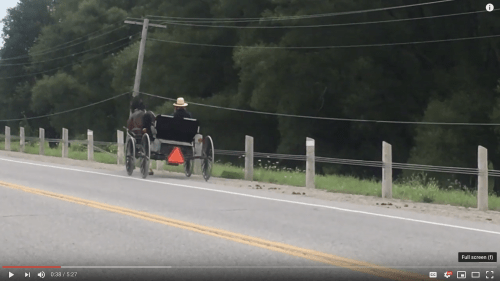 And as well the Mennonites with their horse-drawn buggies out on the side of the roadway. Some times these vehicles move over to the shoulder of the road and some times they don't. If they stay on the roadway, you're going to have to pass. And that's the other reason that you need to know what the slow-moving vehicle sign is. And you need to practice in and around the licensing center where you're going to be taking your road test because if there's an industrial area, or you're taking it in a rural community you're going to find these signs. And you're going to have to be knowledgeable about the slow-moving vehicle sign and vehicles that are doing less than 40 kilometers an hour or 25 miles an hour for those of you in the States. So here in Huron County there are Mennonites who live in the area so there's horse-drawn vehicles. 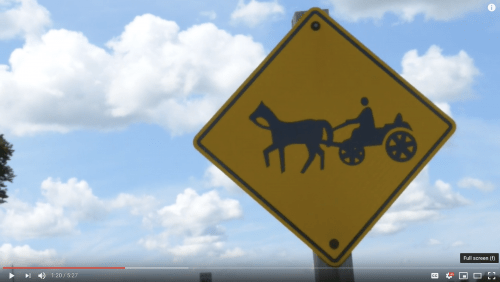 You can see the sign here that warns traffic of the horse-drawn buggies along the roadways. And as well as I said, you're going to have to pass and you need to be careful when you're passing because it is one of the highest risk crashes. And often times head-on crashes result in fatality. So know that and when you're passing, take note of the road markings. get a dotted line on your side of the road. If it's a single solid line you can pass, but pass with caution. And as well, if you're not careful or not comfortable with the gap, work with a veteran driver - somebody else who can help you with judging the gap to be able to pass safely and pass successfully. es are away from you. And that way that will give you some idea of how to pass successfully. When you're passing these vehicles--these slow-moving vehicles--which can be either farm equipment horse-drawn vehicles if you're an industrial area these'll be industrial equipment or if you're around a marine environment those types of things. All of these slow-moving vehicles will be there and you will need to know how to handle these and to identify this sign on the back of these vehicles. Now as well, know that on some of this older farm equipment, the slow moving vehicle signs... they've been on there for quite a while and they can be faded. So know that as well and just take note of that and be careful when you're passing. Are you taking your road test in a rural community and do you have to deal with slow-moving vehicle signs? 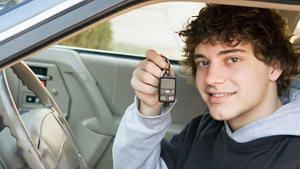 Leave a comment down in the comment section there, all that helps out the new drivers working towards their license. If you like what you see here share, subscribe, leave a comment down in the comment section. As well hit that thumbs up button. Check out all the videos here on the channel if you're working towards your license or starting a career as a truck or bus driver. Lots of great information here. As well, head over to the Smart Drive Test website. Great online courses that you can purchase, and all of the courses are guaranteed - pass your road test first-time with a 30 day money-back guarantee. As well, later this summer we're bringing out "Air Brakes Explained Simply. It's a manual that updates the 40-year-old air brake manuals currently in circulation. As well, there's a hundred multiple-choice questions that you'll be asked on both a theory and a practical exam - so look for that. I'm Rick with Smart Drive Test. Thanks very much for watching. Good luck on your road test. And remember, pick the best answer not necessarily the right answer.